The Local Group is the galaxy group that includes the Milky Way. Its has a total diameter of roughly 3 Mpc (or 10 Mly ≈ 1023 m), and a total mass of the order of 2×1012 solar masses (4×1042 kg). It consists of two clusters of galaxies in a "dumbbell" shape, the Milky Way and its satellites on one hand, and the Andromeda Galaxy and its satellites on the other. The two clusters are separated by about 0.8 Mpc and move towards one another with a velocity of 123 km/h. The group itself is a part of the larger Virgo Supercluster, which may be a part of the Laniakea Supercluster. The total number of galaxies in the Local Group is unknown (due to its partial occlusion by the Milky Way) but known to exceed 54, most of them being dwarf galaxies. The Andromeda Galaxy's satellite system consists of Messier 32 (M32), Messier 110 (M110), NGC 147, NGC 185, Andromeda I (And I), And II, And III, And V, And VI (also known as Pegasus Dwarf Spheroidal Galaxy, or Pegasus DSph), And VII (also known as Cassiopeia Dwarf Galaxy), And VIII, And IX, And X, And XI, And XIX, And XXI and And XXII, plus several additional ultra-faint dwarf spheroidal galaxies. The Milky Way's satellite galaxies system comprises Sagittarius Dwarf Galaxy, Large Magellanic Cloud, Small Magellanic Cloud, Canis Major Dwarf Galaxy (disputed, considered by some not a galaxy), Ursa Minor Dwarf Galaxy, Draco Dwarf Galaxy, Carina Dwarf Galaxy, Sextans Dwarf Galaxy, Sculptor Dwarf Galaxy, Fornax Dwarf Galaxy, Leo I (a dwarf galaxy), Leo II (a dwarf galaxy), and Ursa Major I Dwarf Galaxy and Ursa Major II Dwarf Galaxy, plus several additional ultra-faint dwarf spheroidal galaxies. The Triangulum Galaxy is the third largest member of the Local Group, at about 5×1010 M☉, and the third spiral galaxy. It may or may not be a companion to the Andromeda Galaxy. Pisces Dwarf Galaxy is equidistant from the Andromeda Galaxy and the Triangulum Galaxy, so it may be a satellite of either. The membership of NGC 3109, with its companions Sextans A and the Antlia Dwarf Galaxy, is uncertain due to extreme distances from the center of the Local Group. The other members of the group are likely gravitationally secluded from these large subgroups: IC 10, IC 1613, Phoenix Dwarf Galaxy, Leo A, Tucana Dwarf Galaxy, Cetus Dwarf Galaxy, Pegasus Dwarf Irregular Galaxy, Wolf–Lundmark–Melotte, Aquarius Dwarf Galaxy, and Sagittarius Dwarf Irregular Galaxy. Local Group of galaxies, including the massive members Messier 31 (Andromeda Galaxy) and Milky Way, as well as other nearby galaxies. The term "The Local Group" was introduced by Edwin Hubble in Chapter VI of his 1936 book The Realm of the Nebulae. There, he described it as "a typical small group of nebulae which is isolated in the general field" and delineated, by decreasing luminosity, its members to be M31, Milky Way, M33, Large Magellanic Cloud, Small Magellanic Cloud, M32, NGC 205, NGC 6822, NGC 185, IC 1613 and NGC 147. He also identified IC 10 as a possible part of Local Group. By 2003, the number of known Local Group members had increased from his initial 12 to 36.
at about 125% of the mass of the Milky Way. Diameter: 220 kly, mass: (1.15±0.35)×1012 M☉, number of stars: ca. 1012. Diameter: 175±25 kly, mass: (1.3±0.3)×1012 M☉, number of stars: (2.5±1.5)×1011. Triangulum Galaxy (M33, NGC 598) SA(s)cd Triangulum Third largest, only unbarred spiral galaxy and possible satellite of the Andromeda Galaxy. Diameter: 60 kly, mass: 5×1010 M☉, number of stars: 4×1010. Small Magellanic Cloud (SMC, NGC 292) SB(s)m pec Tucana Satellite of Milky Way, 6th largest galaxy in the local group with mass of between 7.5 and 8 billion solar mass. Large Magellanic Cloud (LMC) Irr/SB(s)m Dorado Fourth largest member of the group, satellite of Milky Way, mass between 10 and 85 billion solar masses. Recent finding puts it at 10% mass of Milky Way Galaxy. Aquarius Dwarf (DDO 210) IB(s)m Aquarius Distance 3.2 million light years. Quite isolated in space, membership to Local Group established in 1999. M110 (NGC 205) dE6p Andromeda Satellite of the Andromeda Galaxy and 5th largest galaxy with the mass of 9.3 billion solar masses. SagDIG (Sagittarius Dwarf Irregular Galaxy) IB(s)m V Sagittarius Most remote from barycenter member thought to be in the Local Group. Horologium dSph or Globular Cluster Horologium Satellite of the Milky Way. Not to be confused with the Horologium Supercluster. Andromeda IV Irr Andromeda Once considered to be associated with M31. Its distance is now known to be 22 to 24 million light years (not close to the Andromeda Galaxy at all). ^ The mass of the Local Group is essentially accounted for by the mass of the Milky Way and the Andromeda Galaxy. Estimates for the mass of each galaxy are compatible with 1023 M☉, and Peñarrubia et al. (2014) estimate (2.3±0.7)×1012 M☉ for the Local Group, but Karachentsev and Kashibadze (2006) estimate the somewhat lower value of (1.29±0.14)×1012 M☉. ^ a b c Karachentsev, I. D.; Kashibadze, O. G. (2006). "Masses of the local group and of the M81 group estimated from distortions in the local velocity field". Astrophysics. 49 (1): 3–18. Bibcode:2006Ap.....49....3K. doi:10.1007/s10511-006-0002-6. ^ Kalirai, Jason S.; Beaton, Rachael L.; Geha, Marla C.; Gilbert, Karoline M.; Guhathakurta, Puragra; Kirby, Evan N.; Majewski, Steven R.; Ostheimer, James C.; Patterson, Richard J. (2010-02-17). "THE SPLASH SURVEY: INTERNAL KINEMATICS, CHEMICAL ABUNDANCES, AND MASSES OF THE ANDROMEDA I, II, III, VII, X, AND XIV DWARF SPHEROIDAL GALAXIES". The Astrophysical Journal. 711 (2): 671–692. arXiv:0911.1998. Bibcode:2010ApJ...711..671K. doi:10.1088/0004-637X/711/2/671. ISSN 0004-637X. ^ Sergey E. Koposov; Vasily Belokurov; Gabriel Torrealba; N. Wyn Evans (10 March 2015). "Beasts of the Southern Wild. Discovery of a large number of Ultra Faint satellites in the vicinity of the Magellanic Clouds". The Astrophysical Journal. 805 (2): 130. arXiv:1503.02079. Bibcode:2015ApJ...805..130K. doi:10.1088/0004-637X/805/2/130. ^ "The Local Group". NASA's High Energy Astrophysics Science Archive Research Center (HEASARC). NASA. Retrieved 2015-05-05. ^ Kalirai, Jason S.; Beaton, Rachael L.; Geha, Marla C.; Gilbert, Karoline M.; Guhathakurta, Puragra; Kirby, Evan N.; Majewski, Steven R.; Ostheimer, James C.; Patterson, Richard J.; Wolf, Joe (2012). "The observed properties of dwarf galaxies in and around the Local Group". The Astronomical Journal. 144: 4. arXiv:1204.1562. doi:10.1088/0004-6256/144/1/4. ^ van den Bergh, Sidney (May 2003). "History of the Local Group". To be Published In: "The Local Group as an Astrophysical Laboratory": 5042. arXiv:astro-ph/0305042. Bibcode:2003astro.ph..5042V. ^ Kalirai, Jason S.; Beaton, Rachael L.; Geha, Marla C.; Gilbert, Karoline M.; Guhathakurta, Puragra; Kirby, Evan N.; Majewski, Steven R.; Ostheimer, James C.; Patterson, Richard J.; Wolf, Joe (2018). "Evidence for an Intermediate-Mass Milky Way from Gaia DR2 Halo Globular Cluster Motions". arXiv:1804.11348 [astro-ph.GA]. ^ "The Galaxies of the Local Group". . Kalirai, Jason S.; Beaton, Rachael L.; Geha, Marla C.; Gilbert, Karoline M.; Guhathakurta, Puragra; Kirby, Evan N.; Majewski, Steven R.; Ostheimer, James C.; Patterson, Richard J.; Wolf, Joe (2015). "Rings and Radial Waves in the Disk of the Milky Way". The Astrophysical Journal. 801 (2): 105. arXiv:1503.00257. doi:10.1088/0004-637X/801/2/105. ^ "A bridge of stars connects two dwarf galaxies". 2017-02-08. ^ a b van den Bergh, Sidney (April 2000). "Updated Information on the Local Group". The Publications of the Astronomical Society of the Pacific. 112 (770): 529–536. arXiv:astro-ph/0001040. Bibcode:2000PASP..112..529V. doi:10.1086/316548. ^ Ziljstra, A. A.; Minniti, Dante (April 1999). "A Dwarf Irregular Galaxy at the Edge of the Local Group: Stellar Populations and Distance of IC 5152". Astronomical Journal. 117 (4): 1743–1757. arXiv:astro-ph/9812330. Bibcode:1999AJ....117.1743Z. doi:10.1086/300802. Retrieved 2011-03-11. ^ van de Steene, G. C.; et al. (2006). "Distance determination to NGC 55 from the planetary nebula luminosity function". Astronomy and Astrophysics. 455 (3): 891–896. Bibcode:2006A&A...455..891V. doi:10.1051/0004-6361:20053475. ^ Jensen, Joseph B.; Tonry, John L.; Barris, Brian J.; Thompson, Rodger I.; et al. (February 2003). "Measuring Distances and Probing the Unresolved Stellar Populations of Galaxies Using Infrared Surface Brightness Fluctuations". Astrophysical Journal. 583 (2): 712–726. arXiv:astro-ph/0210129. Bibcode:2003ApJ...583..712J. doi:10.1086/345430. ^ Nowakowski, Tomasz (22 December 2015). "Andromeda IV turns out to be a solitary gas-rich dwarf galaxy". physorg. Retrieved 25 December 2015. ^ Grocholski, Aaron J.; Aloisi, Alessandra; van der Marel, Roeland P.; Mack, Jennifer; et al. (October 20, 2008). "A New Hubble Space Telescope Distance to NGC 1569: Starburst Properties and IC 342 Group Membership". Astrophysical Journal Letters. 686 (2): L79–L82. arXiv:0808.0153. Bibcode:2008ApJ...686L..79G. doi:10.1086/592949. ^ "Pal3". simbad.u-strasbg.fr. Retrieved 26 August 2017. ^ Wakker, B. P.; York, D. G.; Wilhelm, R.; Barentine, J. C.; Richter, P.; Beers, T. C.; Ivezić, Ž.; Howk, J. C. (2008). "Distances to Galactic High‐Velocity Clouds. I. Cohen Stream, Complex GCP, Cloud g1". The Astrophysical Journal. 672 (1): 298–319. arXiv:0709.1926. Bibcode:2008ApJ...672..298W. doi:10.1086/523845. ^ "Massive Gas Cloud Speeding Toward Collision With Milky Way". Retrieved 2008-06-06.
van den Bergh, Sidney (2000). "Updated Information on the Local Group". The Publications of the Astronomical Society of the Pacific. 112 (770): 529–536. arXiv:astro-ph/0001040. Bibcode:2000PASP..112..529V. doi:10.1086/316548. The Andromeda Galaxy (), also known as Messier 31, M31, or NGC 224, is a spiral galaxy approximately 780 kiloparsecs (2.5 million light-years) from Earth, and the nearest major galaxy to the Milky Way. Its name stems from the area of the Earth's sky in which it appears, the constellation of Andromeda. combined with preliminary reports on a 2019 study estimating a higher mass of the Milky Way. The Andromeda Galaxy has a diameter of about 220,000 light-years, making it the largest member of the Local Group at least in terms of extension, if not mass. The number of stars contained in the Andromeda Galaxy is estimated at one trillion (1×1012), or roughly twice the number estimated for the Milky Way.The Milky Way and Andromeda galaxies are expected to collide in ~4.5 billion years, merging to form a giant elliptical galaxy or a large lenticular galaxy. With an apparent magnitude of 3.4, the Andromeda Galaxy is among the brightest of the Messier objects making it visible to the naked eye from Earth on moonless nights, even when viewed from areas with moderate light pollution. Andromeda V is a dwarf spheroidal galaxy about 2.52 Mly away in the constellation Andromeda.Andromeda V was discovered by Armandroff et al. and published in 1998 after their analysis of the digitized version of the second Palomar Sky Survey.The metallicity of Andromeda V is above the average metallicity to luminosity ratio of the Local Group's dwarf galaxies. Andromeda XI (And 11) is a dwarf spheroidal galaxy about 2.6 million light-years away from the Sun in the constellation Andromeda. Discovered in 2006, And XI is a satellite galaxy of the Andromeda Galaxy (M31). The Andromeda–Milky Way collision is a galactic collision predicted to occur in about 3.75 billion years between two galaxies in the Local Group—the Milky Way (which contains the Solar System and Earth) and the Andromeda Galaxy. The stars involved are sufficiently far apart that it is improbable that any of them will individually collide. Some stars will be ejected from the resulting galaxy, nicknamed Milkomeda or Milkdromeda. The Aquarius Dwarf is a dwarf irregular galaxy, first catalogued in 1959 by the DDO survey. It is located within the boundaries of the constellation of Aquarius. It is a member of the Local Group of galaxies, albeit an extremely isolated one; it is one of only a few known Local Group members for which a past close approach to the Milky Way or Andromeda galaxy can be ruled out, based on its current location and velocity. Local Group membership was firmly established only in 1999, with the derivation of a distance based on the tip of the red-giant branch method. Its distance from the Milky Way of 3.2 ±0.2 Mly (980 ±40 kpc) means that Aquarius Dwarf is quite isolated in space. It is one of the least luminous Local Group galaxies to contain significant amounts of neutral hydrogen and support to ongoing star formation, although it does so only at an extremely low level. Because of its large distance, the Hubble Space Telescope is required in order to study its stellar populations in detail. RR Lyrae stars have been discovered in Aquarius Dwarf, indicating the existence of stars more than 10 billion years old, but the majority of its stars are much younger (median age 6.8 billion years). Among Local Group galaxies, only Leo A has a younger mean age, leading to the suggestion that delayed star formation could be correlated with galaxy isolation. Chiricahua ( CHIRR-i-KAH-wə) are a band of Apache Native Americans, based in the Southern Plains and Southwest United States. Culturally related to other Apache peoples, Chiricahua historically shared a common area, language, customs, and intertwined family relations. At the time of European contact, they had a territory of 15 million acres (61,000 km2) in Southwestern New Mexico and Southeastern Arizona in the United States and in Northern Sonora and Chihuahua in Mexico. Today Chiricahua are enrolled in two federally recognized tribes in the United States: the Fort Sill Apache Tribe, located near Apache, Oklahoma with a small reservation outside Deming, New Mexico, and the Mescalero Apache Tribe of the Mescalero Reservation near Ruidoso, New Mexico. The San Carlos Apache Tribe, Arizona does have Chiricahua Apache people there also. A galaxy group or group of galaxies (GrG) is an aggregation of galaxies comprising about 50 or fewer gravitationally bound members, each at least as luminous as the Milky Way (about 1010 times the luminosity of the Sun); collections of galaxies larger than groups that are first-order clustering are called galaxy clusters. The groups and clusters of galaxies can themselves be clustered, into superclusters of galaxies. The Milky Way galaxy is part of a group of galaxies called the Local Group. Group Policy is a feature of the Microsoft Windows NT family of operating systems that controls the working environment of user accounts and computer accounts. Group Policy provides centralized management and configuration of operating systems, applications, and users' settings in an Active Directory environment. A set of Group Policy configurations is called a Group Policy Object (GPO). A version of Group Policy called Local Group Policy (LGPO or LocalGPO) allows Group Policy Object management without Active Directory on standalone computers. The Large Magellanic Cloud (LMC) is a satellite galaxy of the Milky Way. At a distance of about 50 kiloparsecs (≈163,000 light-years), the LMC is the second- or third-closest galaxy to the Milky Way, after the Sagittarius Dwarf Spheroidal (~16 kpc) and the possible dwarf irregular galaxy known as the Canis Major Overdensity. Based on readily visible stars and a mass of approximately 10 billion solar masses, the diameter of the LMC is about 14,000 light-years (4.3 kpc), making it roughly one one-hundredth as massive as the Milky Way. This makes the LMC the fourth-largest galaxy in the Local Group, after the Andromeda Galaxy (M31), the Milky Way, and the Triangulum Galaxy (M33). The LMC is classified as a Magellanic spiral. It contains a stellar bar that is geometrically off-center, suggesting that it was a barred dwarf spiral galaxy before its spiral arms were disrupted, likely by tidal interactions from the Small Magellanic Cloud (SMC), and the Milky Way's gravity.With a declination of about -70°, the LMC is visible as a faint "cloud" only in the southern celestial hemisphere and from latitudes south of 20° N, straddling the border between the constellations of Dorado and Mensa, and appears longer than 20 times the Moon's diameter (about 10° across) from dark sites away from light pollution.The Milky Way and the LMC are expected to collide in approximately 2.4 billion years. This is a list of known galaxies within 3.59 megaparsecs (11.7 million light-years) of the Solar System, in ascending order of distance. This encompasses all of the about 50 Local Group galaxies, and some that are members of neighboring galaxy groups, the M81 Group and the Centaurus A/M83 Group, and some that are currently not in any defined galaxy group. The list aims to reflect current knowledge: not all galaxies within the 3.59 Mpc radius have been discovered. Nearby dwarf galaxies are still being discovered, and galaxies located behind the central plane of the Milky Way are extremely difficult to discern. It is possible for any galaxy to mask another located beyond it. Intergalactic distance measurements are subject to large uncertainties. Figures listed are composites of many measurements, some of which may have had their individual error bars tightened to the point of no longer overlapping with each other. The Local Sheet in astronomy is a nearby extragalactic region of space where the Milky Way, the members of the Local Group and other galaxies share a similar peculiar velocity. This region lies within a radius of about 7 Mpc (23 Mly), 0.46 Mpc (1.5 Mly) thick, and galaxies beyond that distance show markedly different velocities. The Local Group has only a relatively small peculiar velocity of 66 km⋅s−1 with respect to the Local Sheet. Typical velocity dispersion of galaxies is only 40 km⋅s−1 in the radial direction. Nearly all nearby bright galaxies belong to the Local Sheet. The Local Sheet is part of the Local Volume and is in the Virgo Supercluster (Local Supercluster). The Local Sheet forms a wall of galaxies delineating one boundary of the Local Void.A significant component of the mean velocity of the galaxies in the Local Sheet appears as the result of the gravitational attraction of the Virgo Cluster of galaxies, resulting in a peculiar motion ~185 km⋅s−1 toward the cluster. A second component is directed away from the center of the Local Void; an expanding region of space spanning an estimated 45 Mpc (150 Mly) that is only sparsely populated with galaxies. This component has a velocity of 259 km⋅s−1. The Local Sheet is inclined 8° from the Local Supercluster (Virgo Supercluster).The so-called Council of Giants is a ring of twelve large galaxies surrounding the Local Group in the Local Sheet, with a radius of 3.75 Mpc (12.2 Mly). Ten of these are spirals, while the remaining two are ellipticals. The two ellipticals (Maffei 1 and Centaurus A) lie on opposite sides of the Local Group, and their formation may have prompted the development of the Local Group. The Local Sheet's own development outlines a concentration of dark matter in a filament. * The mass is given as the logarithm of the mass in solar masses. in 1999 by Johnson and Modjaz, and another detected in 2002, by Nakano and Sumoto. The latter, designated EQ J004015.8+414420, had also been captured in images taken by the Sloan Digital Sky Survey (SDSS) in October, 2002.About half of the Andromeda's satellite galaxies are orbiting the host galaxy along a highly flattened plane, with 14 out of 16 following the same sense of rotation. One theory proposes that these objects once belonged to a subhalo surrounding NGC 205, then the group was broken up by tidal forces during a close encounter with Andromeda. Messier 32 (also known as M32 and NGC 221) is a dwarf "early-type" galaxy located about 2.65 million light-years from Earth, appearing in the constellation Andromeda. M32 is a satellite galaxy of the Andromeda Galaxy (M31) and was discovered by Guillaume Le Gentil in 1749. M32 measures 6.5 ± 0.2 thousand light-years in diameter at the widest point.The galaxy is a prototype of the relatively rare, compact elliptical (cE) galaxy class. Half the stars concentrate within an effective radius of only 100 parsecs. Densities in the central stellar cusp increase steeply, exceeding 3×107 M⊙ pc−3 at the smallest radii resolved by HST, and the half-light radius of this central star cluster is around 6 parsec. Like more ordinary elliptical galaxies, M32 contains mostly older faint red and yellow stars with practically no dust or gas and consequently no current star formation. It does, however, show hints of star formation in the relatively recent past. Large, quite faint, irregularly round; it brightens in the middle to a stellar nucleus. The membership of NGC 147 in the Local Group was confirmed by Walter Baade in 1944 when he was able to resolve the galaxy into individual stars with the 100-inch (2.5 m) telescope at Mount Wilson near Los Angeles. NGC 185 (also known as Caldwell 18) is a dwarf spheroidal galaxy located 2.08 million light-years from Earth, appearing in the constellation Cassiopeia. It is a member of the Local Group, and is a satellite of the Andromeda Galaxy (M31). NGC 185 was discovered by William Herschel on November 30, 1787, and he cataloged it "H II.707". John Herschel observed the object again in 1833 when he cataloged it as "h 35", and then in 1864 when he cataloged it as "GC 90" within his General Catalogue of Nebulae and Clusters. NGC 185 was first photographed between 1898 and 1900 by James Edward Keeler with the Crossley Reflector of Lick Observatory. Unlike most dwarf elliptical galaxies, NGC 185 contains young stellar clusters, and star formation proceeded at a low rate until the recent past. NGC 185 has an active galactic nucleus (AGN) and is usually classified as a type 2 Seyfert galaxy, though its status as a Seyfert is questioned. It is possibly the closest Seyfert galaxy to Earth, and is the only known Seyfert in the Local Group. A supercluster is a large group of smaller galaxy clusters or galaxy groups; it is among the largest-known structures of the cosmos. The Milky Way is part of the Local Group galaxy group (which contains more than 54 galaxies), which in turn is part of the Virgo Cluster, which is part of the Laniakea Supercluster. This supercluster spans over 500 million light-years, while the Local Group spans over 10 million light-years. The large size and low density of superclusters means they, unlike clusters, expand with the Hubble expansion. The number of superclusters in the observable universe is estimated to be 10 million. The Triangulum Galaxy is a spiral galaxy approximately 3 million light-years (ly) from Earth in the constellation Triangulum. It is catalogued as Messier 33 or NGC 598. The Triangulum Galaxy is the third-largest member of the Local Group of galaxies, behind the Milky Way and the Andromeda Galaxy. It is one of the most distant permanent objects that can be viewed with the naked eye. The galaxy is the smallest spiral galaxy in the Local Group and it is believed to be a satellite of the Andromeda Galaxy due to their interactions, velocities, and proximity to one another in the night sky. It also has an H II nucleus. away in the constellation Virgo. Comprising approximately 1300 (and possibly up to 2000) member galaxies, the cluster forms the heart of the larger Virgo Supercluster, of which the Local Group (containing our Milky Way galaxy) is a member. The Local Group actually experiences the mass of the Virgo Supercluster as the Virgocentric flow. It is estimated that the Virgo Cluster's mass is 1.2×1015 M☉ out to 8 degrees of the cluster's center or a radius of about 2.2 Mpc.Many of the brighter galaxies in this cluster, including the giant elliptical galaxy Messier 87, were discovered in the late 1770s and early 1780s and subsequently included in Charles Messier's catalogue of non-cometary fuzzy objects. Described by Messier as nebulae without stars, their true nature was not recognized until the 1920s.The cluster subtends a maximum arc of approximately 8 degrees centered in the constellation Virgo. Although some of the cluster's most prominent members can be seen with smaller instruments, a 6-inch telescope will reveal about 160 of the cluster's galaxies on a clear night. Its brightest member is the elliptical galaxy Messier 49; however its most famous member is the elliptical galaxy Messier 87, which is located in the center of the cluster. The Virgo Supercluster (Virgo SC) or the Local Supercluster (LSC or LS) is a mass concentration of galaxies containing the Virgo Cluster and Local Group, which in turn contains the Milky Way and Andromeda galaxies. 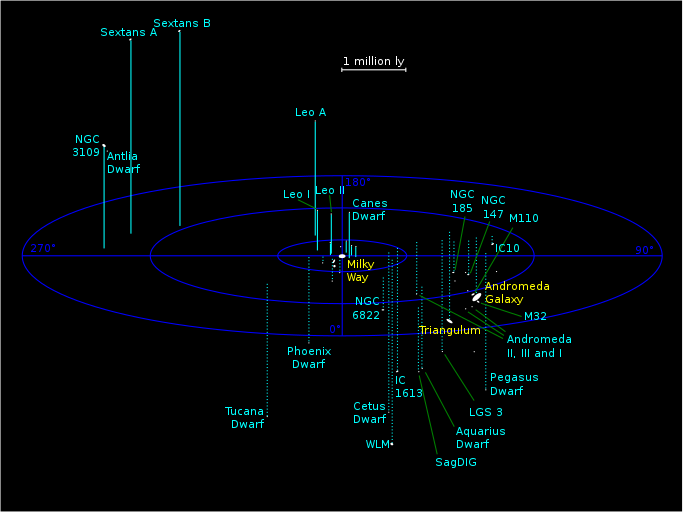 At least 100 galaxy groups and clusters are located within its diameter of 33 megaparsecs (110 million light-years). The Virgo SC is one of about 10 million superclusters in the observable universe and is in the Pisces–Cetus Supercluster Complex, a galaxy filament. A 2014 study indicates that the Virgo Supercluster is only a lobe of an even greater supercluster, Laniakea, a larger, competing referent of Local Supercluster centered on the Great Attractor. Each → may be read as "within" or "part of".